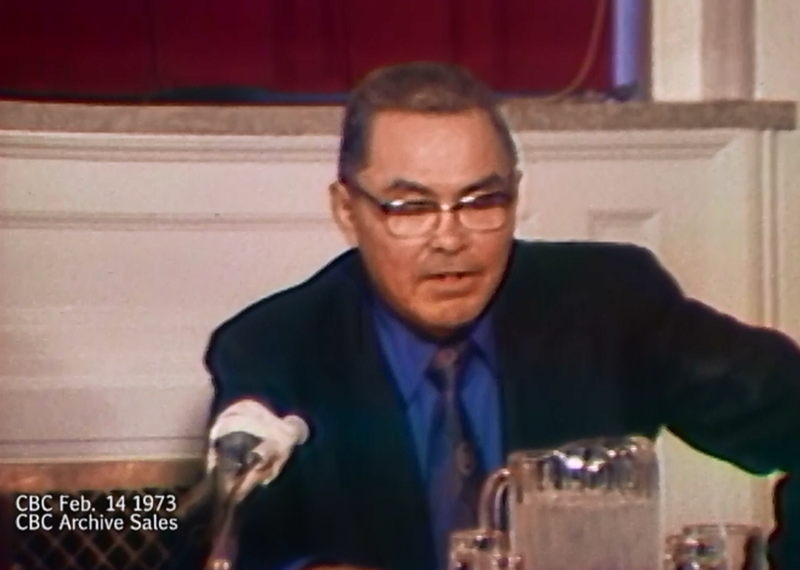 On February 14, 1973, the Yukon Native Brotherhood, led by Elijah Smith, along with a delegation of Yukon First Nation leaders, presented Together Today for our Children Tomorrow: A Statement of Grievances and an Approach to Settlement by the Yukon Indian People to then Canadian Prime Minister Pierre Elliott Trudeau. This ground-breaking document was developed by the Yukon Native Brotherhood in close consultation with Yukon First Nation Elders and community members. It laid out the past and present state of Yukon First Nations. It also made recommendations for a better future, including land and cash settlements. Prime Minister Trudeau accepted the statement on behalf of the Government of Canada. Together Today for our Children Tomorrow became the basis for negotiating Yukon First Nation land claims. The Yukon Indian Chiefs sum up their position in one sentence which reads: many of our people feel that our grievances are so great that there is no way we can be compensated for what has happened to us. Having said that Chief Elijah Smith of the Native Brotherhood doesn’t bother about legal or Aboriginal rights, rather he works from the assumption that Ottawa has a political and moral obligation to make a deal with the Yukon Indians who have never signed treaties like their brothers in southern Canada. The Indians say it will take more than cash to solve their problems; they want to participate in the development of their land. In their words, “We will not sell our heritage for a quick buck or a temporary job.” On that understanding they are leaving the specifics open to negotiation, the amount of land, the cash settlement, the percentage of royalties. We are not here looking for a handout, we are here with a plan, that will cost the Canadian tax payer much less than if the present government policies and programs continue. This approach which you have taken in here is one therefore which is very welcome to the government. We think that it is a much much more fruitful way of solving the problems than trying to re-write history.